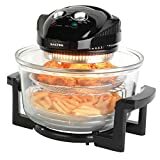 This Halogen Oven is a very similar product to the others, although the lower wattage element reduces the top temperature of the cooker a little so slightly longer cooking time required. It is delivered with Tongs and High and Low grill racks only . Other accessories, Steamer and Frying Pan, lid stand and Lid extension ring ( expanding capacity to 17 Litres) , are all extra, so you need other purchases before starting to cook. The delivery was in good time and everything arrived in good and working order,but despite the initial purchase being well under the average price , the lack of accessories meant it would be the most expensive unit tested , when compared like for like. Delivered together with the “Halogen Oven Cookery book” a primer in the use of the oven, showing basic methods and recipes, I found the Clifford James unit to be good, functional and reasonable value but far from the best price. The bowl was 30cm wide and the total height if you are worried about overhead cupboards is 25cm.